Six years ago Virgilia Lopez didn’t know a thing about growing coffee. She didn’t know how to work the land to plant and grow, or how to process the beans, but she learned with the help of older farmers who took the time to teach her and other women from the community in San Miguel Escobar (SME). Virgilia was one of the first women to join the cooperative with her sister-in-law Lesbia, later Marta joined, followed by others. In the beginning one of the biggest challenges was balancing her time between the fields and the workload at home. Growing coffee is not simple. The plants need a lot of care throughout the year. 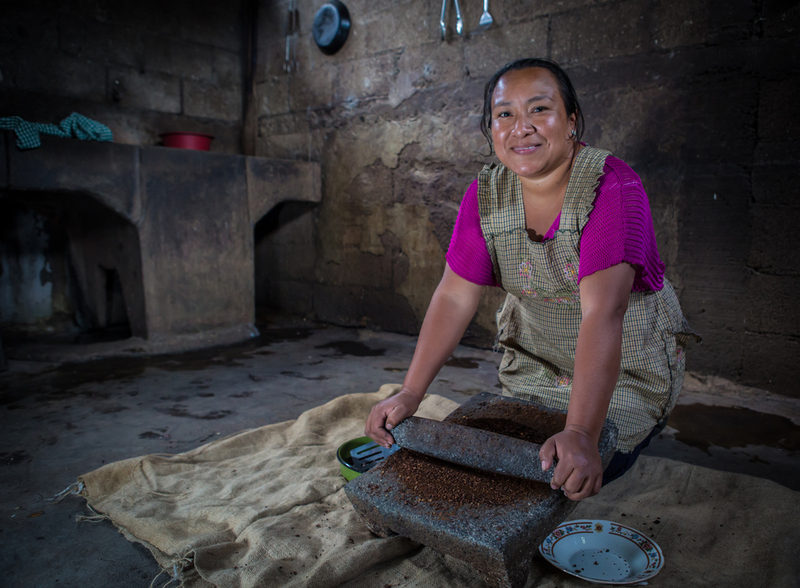 During harvest season, the busiest time of the year for coffee farmers, she wakes every morning before dawn. A day in the life of Virgilia starts with laundry and with plenty of young children there is always a lot to do. At 5:30am she begins her work with coffee. This time of year (March), with the harvest in full-swing, the first thing she does is wash the coffee that she de-pulped the night before. Washing coffee is a timely task as it needs two or three passes through the water. 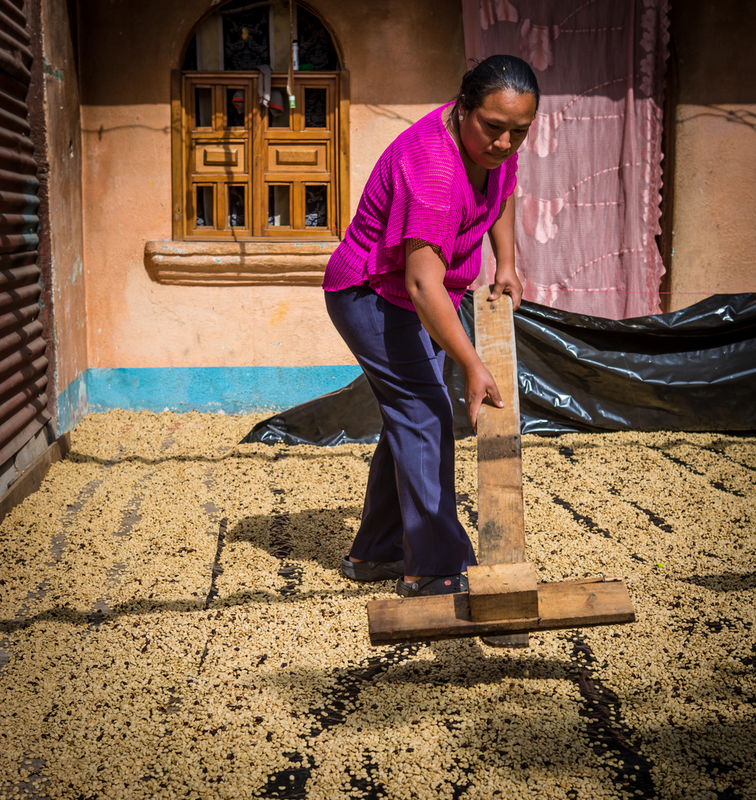 Next she lays the freshly washed coffee out on her roof to begin the drying process. Once she is done she heads up to her fields to pick coffee. At 1pm she returns, carrying her coffee down, as she lacks a horse to bear the load. At this time she prepares lunch for her family, including her husband who comes home each day to enjoy the midday meal.. The rest of the afternoon is spent de-pulping the new coffee fruit, raking her coffee that is drying, picking up her kids from school, cleaning the house, and making dinner. Virgilia doesn’t have more than a moment to rest until 10pm. During harvest season Virgilia will hire three or four other members from the community to help her pick coffee in the fields. She is proud of her accomplishments and her ability to provide for her family. Each year she sets high goals. In 2014, Virgilia received her second land loan from the Women’s Fund to buy another cuerda (⅓ acres) of land and in 2015 she exported 2,500 pounds of green coffee with DLG - this accounted for 6% of the total export for the SME Cooperative. This year her goal is to produce 3,500 pounds of green coffee; she will export 3,000 pounds and keep the rest for sale in Guatemala and to give to visitors during coffee tours. Virgilia’s determination to work hard and set goals is impressive considering the obstacles she has faced. Soon after she received her last land loan her husband fell ill, leaving her as the head of the household and breadwinner. Despite this challenge she was able to ensure her four children were able to continue their studies. She reiterates that her work is for the future of her children, “so they can find a good job, graduate from school, and go to university to achieve something greater.” Angelic, 18, graduated from a two-year college program. Luis, 15, is in 9th grade and one of her biggest supports, not only does he help with coffee but he is also an amazing cook. Haydee, 12, is in 5th grade, and Emanuel her youngest is 3 years old. In addition to being the third largest exporter from the SME Cooperative, a dedicated and supportive mother and wife, Virgilia also hosts visitors for lunch in her home and is actively involved in our community tourism program. “Don’t get disheartened if you are struggling, you won’t learn it overnight, it takes time, and you will get it… You can do it. You can support Virgilia, and other female farmers in the cooperatives we work by making a contribution to the Women’s Fund by contacting Beth Johnson at beth@dlgcoffee.org, by buying coffee online in our store as 31% of all exporting cooperative members across our five partner cooperatives are women. Lastly, you can visit us here in Guatemala, join a coffee tour and enjoy a traditional Guatemalan lunch in their home.